As part of a project to assess what's needed to build a staple foods system in Appalachia, the Appalachian Staple Foods Collaborative hosted a workshop at the Eclipse Company Store on Thursday, July 30, to present an overview of the project, test a number of recipes on the attenders, explain networks and mapping, and ask participants to engage in a very interactive evening of discussion and feedback about marketing, food policy, and next steps. Michelle Ajamian, Executive Director of the Appalachian Staple Foods Collaborative reported to the group about ASFC's scope of activity, the center of which is to map and build a network of people who can bring about a staple foods system in our region. June Holley of Networkweaving, presented the network maps thus far, and eight volunteer table hosts facilitated discussions and surveys of more than 50 participants who eagerly shared their ideas and questions. 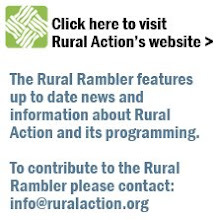 Rural Action has played a key role as fiscal agent in several grants that are moving the project forward. Funding from the Sociological Initiatives Foundation is key to the network building and assessments that have allowed ASFC to bring in the expertise of Robin Stewart from the Voinovich School of Leadership and Public Affairs and June Holly of Network Weaving. Additional funding to the collaborative from the Ohio Dept of Agriculture, The Center for Farmland Policy and Innovation, Athens County Commissioners and the City of Athens is fueling research into how publicly owned and managed agricultural land can be used to grow staples, an assessment of what is required to develop a high nutrition cereal from locally grown seed for distribution to low income school children, and the first year of the Athens Food Policy Council. On the ground, Rural Action has also served as fiscal agent for grants received from the Ohio Farm Bureau Foundation and the Athens Foundation to fund equipment for a demonstration market-scale processing facility overseen by Brandon Jaeger, a new farmer whose 2007 SARE Farmer Rancher grant to test some high nutritions staples crops ignited an unexpected demand for market scale local grains and beans. Jaeger is the operations manager for the Collaborative. The Athens Foundation is funding the handling equipment and the Ohio Farm Bureau Foundation is funding the mill. The evening featured June Holley's presentation of network maps she generated from surveys to more than 50 farmers, buyers, distributors and food system supporters (nonprofits, OSU extension, and University research faculty). Among the findings were that there are eight local food business in Athens who are ready to buy one or more staple food grown locally; however, many farmers are not interested in growing these foods, citing market and know-how as barriers. Ajamian emphasized that Ohioans are exporting 95% of their crops, most of which is animal feed going to the commodity system for confined animal feeding operations (CAFOs). The result is a loss economically. In order to benefit the community, the ASFC has a primary mission of food security. "That's why we want to figure out how a high-nutrition cereal can be distributed through a food bank program that sends food home with low-income students on the weekend. Besides that, it's our vision that low-income kids and their families get to be in the front of the line for access to good local food, instead of eating more and more high fructose corn syrup laced food and overly processed commodity grains while those with money are 'eating right' because they can afford it," she said. Jaeger discussed other obstacles to staple food farming. He said that the scale of the agricultural business is growing too quickly for smaller farms to keep up. That's why NCR-SARE and OSU has funded Jaeger to work with two area farmers to demonstrate market-scale production of black beans, meal corn, spelt and amaranth, among others. “Get big or get out is what family farmers have been hearing for decades” he said. He hopes that the production of staple foods will give farmers a reason to grow their business while providing quality food to their community. He also pointed out that the state's feed farmers have the know-how, the acreage, and the equipment to grow nutritious staples. We just need to build the system so it makes sense to broaden their portfolio to include these crops. “Food is a common denominator; it’s a strategy for changing the world,” said Ajamian.